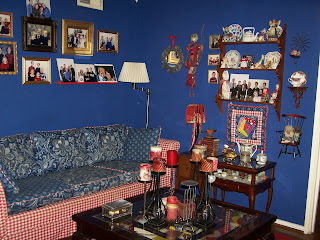 Christmas decorations put away, and the house is back to normal - living room; back wall is graced with a variety of family pictures. A handmade spirit doll on the opposite wall, along with a tribal hat from Tibet, a crazy quilt that I made. And two handmade dolls sitting in the miniature chair. This is just the start of the many collections that I have. I also collect snow globes, and teapots, and I display as many as I can, but have gotten to the point where there is no where to store them. But I do like small things, like boxes, folk art and little keepsakes. Teacup and Saucer collection on the center shelf, which my Grandma Alice started, and I inherited. I also got the shelf and the buffet from her. I have always loved tea cups and saucers, and I think anything you drink from them tastes better. Nothing like feeling elegant any time of the day. 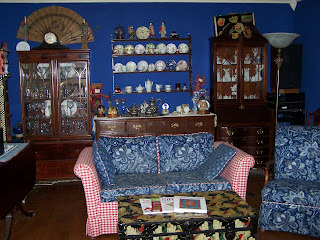 The trunk is from my decoupage career, and I was glad that it never sold, so that I could have it in my living room. It also is a great place to store things in. This is my most favorite room in our house. I love the colors of the walls, as they are so vibrant and the artwork just seems to pop out against them. I had the furniture reupholstered some years ago. I always loved the look of different prints of fabrics together. 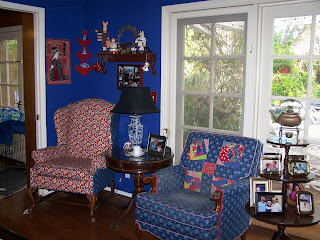 I made the crazy quilt pattern on the blue chair. The guy that did the upholstery loved it, because usually he is doing something really boring, like shades of beige. He was truly elated when my project rolled in the door. I love all of our furniture. It's a warm and cozy room to read in or talk with friends and family.